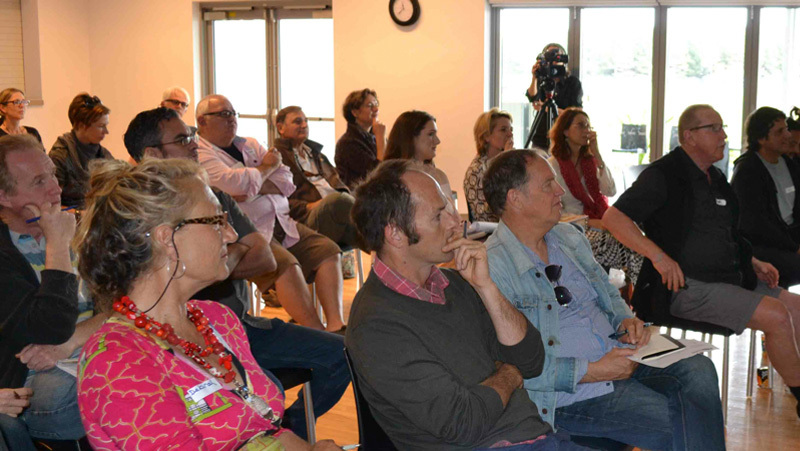 “Absolutely brilliant”, “great advice” and “relevant” were just some of the comments in the feedback from participants at Screenworks Paper to Pitch workshop in Byron Bay on Friday Sept 12. Miriam Stein, Executive Producer from Hatch Entertainment presented to an audience of around 40 Northern Rivers screen content creators on the importance of making commercially viable content for television broadcasters around the world and how to pitch concepts to the broadcasters. Participants had the opportunity to get their screen concepts reviewed by Miriam and her business partner Greg Logan prior to the Paper to Pitch event. At the event Miriam used the reviewed local ideas to demonstrate strong verbal and written pitches, she then ran a group work session guiding each group on how to prepare a script for a sizzle reel. Hatch Entertainment is a production company formed by Miriam and her business partner Greg Logan in 2012 together they bring a fresh approach to creating formats for broadcasters around the world. Following a creatively successful career as a feature film producer and not having made any money from her successes, Miriam Stein decided that if she wanted to use her production skills and stay in the screen industry she had to be more commercially focussed. She partnered with long time friend Greg Logan, who has had a strong and financially successful advertising background and wanted to work in a more creative field. Hatch Entertainment is about creating formats including unscripted, scripted, entertainment, factual, game shows, dating, lifestyle, documentary and comedy. In order to broaden your revenue potential from producing screen content you need to sell your ideas to international broadcasters, distributors and producers. Australian broadcasters are risk adverse and often won’t take new material unless it is proven internationally first. Creating television formats is a way to increase the international potential of your television productions. Formats need to be able to be made in any country around the world. To make formats you first need to know what broadcasters are looking for, you need to hook into what’s happening around the world to find the zeitgeist. Attend industry events and markets, esp MIPCOM in Cannes, Reel Screen in Washington. Will it play in many territories? Does it have social insight and reflect trends? What’s happening in the world at present that people are responding to? What’s selling in television around the world at present? Always research who you are pitching to, make your knowledge of them part of your pitch – know what the broadcaster is programming. Hatch will pitch as many as 15 concepts in a ½ hour meeting and then email the paper pitches for the ones that were of interest. They chose an agency that has a strong list of production companies that they could pitch their ideas to. Each agent in the US prepares a Grid, a brief of what all the broadcasters are looking for. What makes a great one line / verbal pitch? Leave out specifics, names of characters, towns etc not important. Why would the broadcaster want it? What makes a great paper pitch? If you give too much information the core idea can be diluted. You can always send more information later if needed. What makes a great sizzle / pilot? You can see what is being pitched in the US during the Pilot Season. Hollywood Report summarises and reports on the best http://www.hollywoodreporter.com/live-feed/tv-pilots-2014-complete-guide-667314.